Having partnered with a number of new young athletes in recent months, PUMA is pleased to announce the most exciting athlete endorsement of all with the signing of Nigel Ellis. The junior sprinter joins a growing Jamaican line up of PUMA track & field athletes that includes Natasha Morrison, Kaliese Spencer, Asafa Powell, Hansle Parchment, Jaheel Hyde and of course the World’s Fastest Man, Usain Bolt. Nigel Ellis has a big future in track & field ahead of him, under the coaching of Reynaldo Walcott at Steths High School, he lowered his personal bests to 10.16 in the 100m and 20.40 in the 200m at the age of 18, claiming both the 100m and 200m sprint titles at the ISSA Boys & Girls Championships in Kingston. He is also currently the fastest 100m junior athlete in the world. PUMA continues to invest in growing its stable of athletes and partner federations, maintaining its presence in a sport that has always been a rich part of its history. With the Olympics in Rio approaching, PUMA has made significant strides to enrichen its athlete portfolio, continuing its focus on becoming the Fastest Sport Brand in the World. 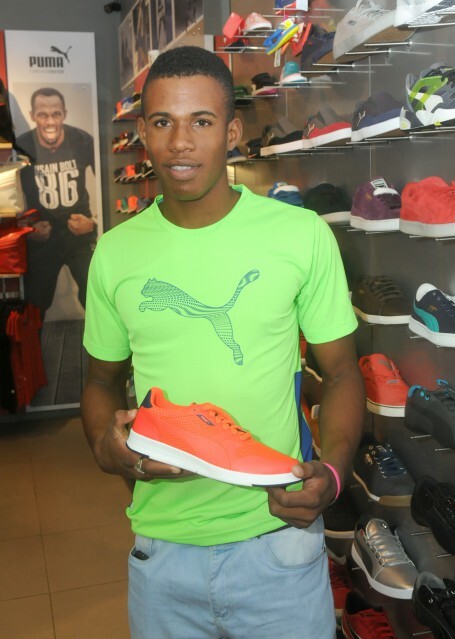 Pascal Rolling, PUMA’s Head of Sports Marketing for Running added, “We are very happy to have signed Nigel. He is improving so quickly and his commitment and desire to measure himself amongst the best is clear. He embodies the spirit and values of PUMA both on and off the track by training and competing hard, while living well with a joy for what he does. He’s a young man with a huge future, and we’re pleased to play a part of the success that will come.